On the weekend of the 2009 All-Star game in Phoenix, Pat Garrity, the treasurer of the National Basketball Players Association, walked into a conference room inside the Sheraton Phoenix determined to make one final stand in his decade of service to the union. Garrity had warned peers and NBPA executive director Billy Hunter prior to the '09 executive committee meeting that he planned to challenge Hunter on business practices, and several players purposely steered clear of the confrontational scene. In the aftermath of the U.S. banking crisis in 2008, Garrity had grown increasingly suspicious of an investment bank project that Hunter had been pitching to the executive committee and player representatives. For Garrity and some peers in the NBPA, the investment made no sense. Hunter had sought a $7 million to $9 million investment from the union into Interstate Net Bank of Cherry Hill, N.J., a financial institution that federal and state banking regulators had slapped with debilitating "cease-and-desist" orders, sources said. Garrity discovered information online that left him feeling obligated to confront Billy Hunter: Hunter's son, Todd, had a seat on the board of directors of Interstate Net Bank. Todd Hunter is also a vice president for Prim Capital, which has a consulting contract with the NBPA that has paid the company in excess of $2.5 million since 2006, according to U.S. Department of Labor filings. "Why didn't you disclose any of this?" Garrity asked Hunter several times at the 2009 meeting, witnesses told Yahoo! Sports. When reached by phone, Garrity confirmed the description of events that sources provided Yahoo! Sports. He declined to further comment. Hunter declined comment for this story through a union spokesman. At the meeting, Hunter left the talking to longtime ally and NBPA chief counsel, Gary Hall, and Hall wasn't offering answers. Garrity and Hall screamed back and forth, and Garrity's questions weren't addressed, witnesses said. Finally, witnesses said, Hall – who died on May 11, 2011 – told Garrity that he was a retired player, no longer welcome on the executive committee, and that security would be called to remove him unless he left on his own. With executive committee members Keyon Dooling and Adonal Foyle appearing uncomfortable – and NBPA president Derek Fisher refusing to use his authority to demand Garrity be allowed to speak over Hall's yelling – Garrity left the room, left the NBPA and never returned again. Fisher declined comment. The potential conflicts were far deeper and connective than Garrity realized at the time, a Yahoo! Sports investigation has discovered. Prim Capital controlled 200,000 shares of ISN Bank stock, according to a 2010 ISN Bank letter to stockholders. In addition to Todd Hunter, another Prim employee, executive Carolyn Kaufman, joined the bank's board of directors of ISN in 2004 and was paid $97,000 and $90,000 in consecutive years, according to a KPMG audit of ISN Bank in January 2008 that Yahoo! Sports obtained. She owned 250 shares of the stock, according to the March 2010 ISN letter to stockholders. The audits had been available online. "Ms. Kaufman was appointed to the board at the request of Prim Capital, which owns 200,000 shares. The combined 200,250 shares represent 4.9 percent of the outstanding shares," the 2010 letter from ISN senior vice president and CFO William Easterday said. Todd Hunter joined the bank's board of directors in 2007, the 2008 audit report says. Records show the bank's deterioration dropped stipends for board members to $12,000 per year in 2007. Todd Hunter did not return multiple messages seeking comment. Kaufman also didn't return a message. The NBPA retained Howrey LLP, a New York law firm, to work as legal counsel on "banking projects," sources told Yahoo! Sports. During most of this engagement, Howrey employed Alexis Hunter, Billy Hunter's daughter. Howrey received its first payment of $60,035 from the NBPA in September 2007 – the same month it hired Alexis Hunter as an associate. She stayed employed at Howrey until March 2011, days before the firm was forced into Chapter 7 bankruptcy by its creditors. During Alexis Hunter's employment with the firm, the NBPA paid Howrey $316,550, according to U.S. Department of Labor filings. After Howrey shut down in March, Alexis Hunter was hired as special counsel at the New York-based law firm of Steptoe & Johnson in April 2011 – within the same period the NBPA hired Steptoe & Johnson to take on a bulk of its legal work for the pending NBA lockout. Alexis Hunter appeared in the Southern District Court of New York in September and October on behalf of the NBPA requesting the court dismiss an antitrust claim by the NBA. Alexis Hunter didn't return a voicemail seeking comment. "We made multi-hour presentations to the union before they eventually selected us to assist them in that case," Steptoe & Johnson labor attorney Lawrence Katz told Yahoo! Sports. Asked when those meetings occurred, Katz said, "Oh, late spring … March or April of 2011." When asked if Alexis Hunter's relationship with her father, Billy Hunter, had anything to do with her hiring or Steptoe securing the NBPA's business, Katz declined comment. Asked whether the union's engagement of the firm that employed Hunter's daughter might represent a conflict of interest, Katz said: "I don’t see how. … I think the question is answered by saying the lawyers the union hired were very well-qualified to practice in this area. Between myself and Steve Wheeless [we've been practicing in this area] for over 60 years. "So it's not as if we got the business as a gift." Steptoe & Johnson has billed the NBPA more than $1 million for its work since April 2011, sources close to the firm told Yahoo! Sports. Steptoe & Johnson and Hunter pushed forward on a legal strategy that called for filing unfair labor practice charges with the National Labor Relations Board against the NBA in August. At the time, this was an unpopular choice with many prominent player agents, who wanted to decertify the union and file an antitrust suit in federal court against the NBA. Steptoe's attorneys and Hunter insisted to players the NLRB would hear the players' case in relatively fast order, but it never happened. In December, the union finally dropped unfair labor practice charges and abandoned the case in preparation for disbanding the Players Association to reach a lockout settlement with the NBA. Two more of Billy Hunter's family members – daughter Robyn Hunter and daughter-in-law Megan Inaba – have senior staff positions in the NBPA's New York office. Robyn Hunter made $86,198 from July 1, 2010, to June 30, 2011, as director of benefits and concierge services, according to Department of Labor filings. Inaba, the wife of Todd Hunter, was paid $180,444 from July 1, 2010, to June 30, 2011. Among her responsibilities are coordinating the union's All-Star weekend gala and summer meetings, as well as running the union's Twitter account and handling other social media responsibilities. In her position as director of special events, Inaba has averaged the sixth-highest salary in the NBPA over the past five years: $148,633 per year, according to the filings. The NBPA's charter does not contain a nepotism policy, sources said. "There's nothing illegal," Billy Hunter told The New York Times on Monday, "and you're not going to find anything illegal, you or anybody else, if that's what you're looking for. I'm not afraid of that." As NBA players lost $400 million in salary during last summer's lockout – and $3 billion over the course of the new 10-year collective bargaining agreement – Billy Hunter, his family and the entities that employed them made approximately $3,430,953 from July 1, 2010, to June 30, 2011, according to labor filings. "The real issue here is whether these potential conflicts were disclosed and the failure of someone who has a fiduciary duty [to union members] to make that disclosure presents a compelling question," Ronald Shechtman, managing partner and chair of Pryor Cashman's Labor and Employment Group, told Yahoo! Sports. "Not only is there a duty to disclose, there is a duty to explain the rationale for routing the business that way so that the fiduciaries [players] can make a judgment that the decision is based on good reason or good cause other than the fact that someone is a relation." These were central themes to Garrity's objections in February 2009 in Phoenix: Due process for hiring, and the appearance of Hunter's family ties impacting union business and finances. Garrity wanted answers about Hunter's motivation for investing into a small New Jersey bank that the Philadelphia Business Journal reported, "was a toxic mix of brokered deposits, construction and land development loans and questionable management." Beyond the banking issue, Garrity raised questions about the process that led to the hiring of Hunter's daughter, Robyn, into a newly created staff position of director of benefits and concierge services. What was the human resources process? Was the job posted? Who else was interviewed? League sources told Yahoo! Sports that the NBPA's health care provider, Cigna, had offered a premium service that would've afforded the Players Association access to a telephone concierge service to answer and assist players on benefits issues. Because the NBA was such an elite account for Cigna, the service would've come free of charge. Billy Hunter rejected the idea, sources said, and within months hired his daughter in a role with some duties similar to the ones that had been offered to the Players Association. The pursuit of the $7 million to $9 million bank investment didn't end in the February 2009 meeting when Garrity raised questions with Derek Fisher, union lawyers and several members of the executive committee in the room. Despite ISN Bank officials sending dire shareholder letters over these same months, Hunter stayed on course seeking an investment from the NBPA. Four months after Garrity confronted Hunter, the push for investment into the failing ISN Bank was still alive at an NBPA meeting in Las Vegas in late June 2009, sources said. The pursuit of ISN Bank eventually ended as ISN spiraled beyond revival in early 2010, sources said. The New Jersey Department of Banking and Insurance closed the bank in September 2010. The FDIC bailout of Interstate Net Bank cost taxpayers $23.9 million. At least one banking executive who was familiar with ISN was concerned about the solvency and stability of the bank. Gerry Banmiller, CEO of First Colonial Bank in Collingswood, N.J., told the Philadelphia Business Journal that he received "more than one phone call" in 2008 asking whether his bank would be interested in purchasing ISN. "But published information about the bank led me to believe that we couldn't have resurrected it," Banmiller told the Journal. "It was in the tomb to stay." The network of Hunter family members in positions of potential conflict and influence with NBPA business has been a crux of Fisher's push for a review of the NBPA's business and financial practices, sources said. Washington Wizards guard Mo Evans, a member of the union's executive committee, told reporters in Washington the committee has addressed potential nepotism issues with Billy Hunter after Fisher's inquiries, and that Hunter addressed any concerns "to our satisfaction." Hunter and the eight-man executive committee have pushed back on Fisher's desire for the audit, and the executive committee recently voted to ask Fisher for his resignation as union president. "The allegations that are now being directed at me are defamatory," Fisher said in a statement on Friday. "But I urge our members to order an independent review beginning immediately and that will be proven along with finding out definitively if there are any issues with the NBPA's business practices and finances." Before Fisher recently confronted Hunter and demanded a review of the union's business and financial practices, Garrity had been the last player in a position of power to truly challenge the union's executive director. As Garrity was shouted down, Fisher and his peers did nothing to back him that day, sources said. Fisher kept saying it wasn't the time or place for such a discussion, witnesses said. When Fisher wouldn't back him, witnesses said, Garrity seemed to understand it was pointless to keep pressing Hunter and Hall. After Garrity left the 2009 meeting, sources said Hunter made a request: He told the executive committee he was owed several years of missed vacation, and that Hunter deserved $1 million in compensation. Eventually, the committee granted it. Garrity and members of the executive committee had been aware of Todd Hunter's role with Prim Capital, an outside contractor to the NBPA. Todd Hunter had worked for Prim Capital of Independence, Ohio, since September 2002, when he was hired as a vice president for the financial planning and investment strategy company. 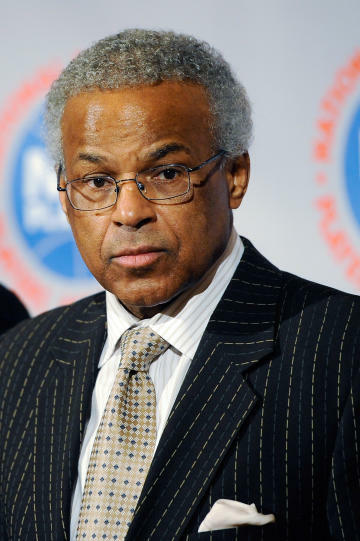 Prim Capital had pitched Billy Hunter and NBPA leadership at the union's summer meeting in 2002 and entered into a signed agreement to run the union's financial awareness program for its 450 players in early 2003. Todd Hunter often runs seminars with each of the 30 NBA teams each season, and an NBA official present at the seminars offers a disclaimer on the league's behalf prior to Prim's presentation. "The disclaimer is specific to Prim as they are contracted by the union as opposed to other presenters who are contracted by both of us [the union and the league]," NBA spokesman Tim Frank told Yahoo! Sports. Prim Capital's chairman and president, Joe Lombardo, worked with Billy Hunter and the NBPA in two previous employments at Merrill Lynch and Prudential, and started Prim Capital in 1997. For most of the 2002-03 NBA season, Prim Capital entered into an agreement with the Players Association to provide a "comprehensive investment portfolio analysis program." Lombardo didn't return a message. Yahoo! Sports obtained the NBPA's 2002-2003 consulting agreement with Prim, which was an exhibit to a complaint in a lawsuit between CSI Capital Management and Prim. The agreement reads, "The NBPA believes that its members will benefit if they have an opportunity to engage in an objective company like Prim." At the beginning of Prim's agreement with the NBPA in 2003, Prim performed financial reviews for players that included the chance to cut themselves into the monies purported to be recovered on the players' behalf. The agreement allowed Prim to share in 50 percent of the savings obtained through restructuring fees through existing money managers. If Prim lowered a player's fees, Prim shared in the savings. CSI Capital Management of San Francisco disagreed with the idea the union was helping to provide independent audits. CSI sued Prim for unfair business practices, slander and that Prim's ostensibly "free and objective" audits were actually being provided in an attempt to encourage players to secure Prim's services. Prim filed a countersuit against CSI and eventually a settlement was reached. Philip Scott Ryan, an attorney for CSI, wrote in a letter to Billy Hunter that "allowing Prim to do audits for your union members is equivalent to having an agent auditing other agent's work. The absence of objectivity and the pressure of unending conflicts of interest are obvious." The NBPA and Prim changed the structure of agreements after the CSI lawsuit, and the union began to pay Prim a flat annual fee for the services, sources said. Prim has been forbidden to take the players as clients. Over the past five years, government filings show the NBPA paid Prim an average of $501,986 a year for its services.